KGRindustries is one of the popular DTH hammer bits manufacturers in Hyderabad with our group of designers, these products are produced using an amusing combination of steel and holds fast to industries benchmark. These tool manufacturers are included in assembling and supplying astounding hammer bits. These products are manufactured for many drilling applications and also can provide hammer bits from many different sources. 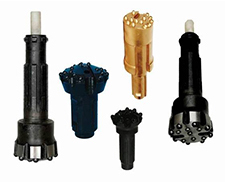 KGRRIGS provide a large inventory of hammer bits. We manufacture thousands of different configurations based on our customer specifications.